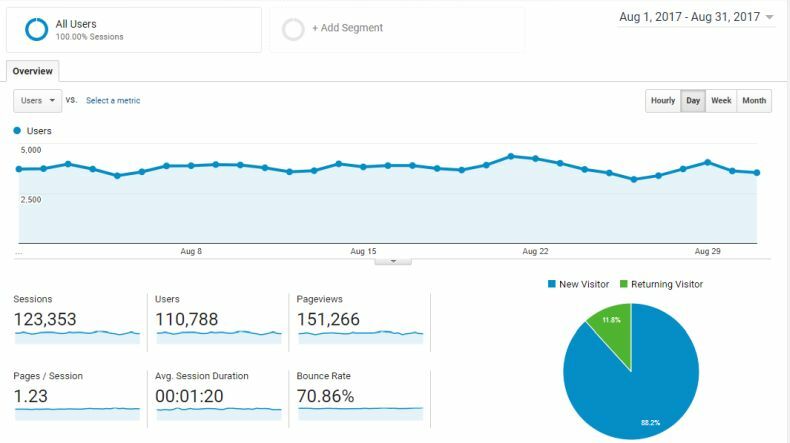 August 2017 marked a very important milestone, first set about 3 years ago, for the first time in this blog's history, total visitor count cracked 100,000 user milestone, and actually reached 110,788. Awesome. The road to this milestone took me 3 years and 10 months and a lot of writing. Daily blogging for almost 4 years. I started this blog with an experiment - Can I blog 365 days in a row? Turns out I can, not only 365 days but almost 4 years. Daily blogging has been my habit ever since, and I'm not planning to stop it. Organic reach, no black or white hat SEO, no link building schemes, all incoming links are gathered in a natural way. I hope it won't take another, almost 4 years to break next, 200,000 user milestone. In fact, I'm looking to get there by the end of 2018 (or in 16 months). Hard, but doable.